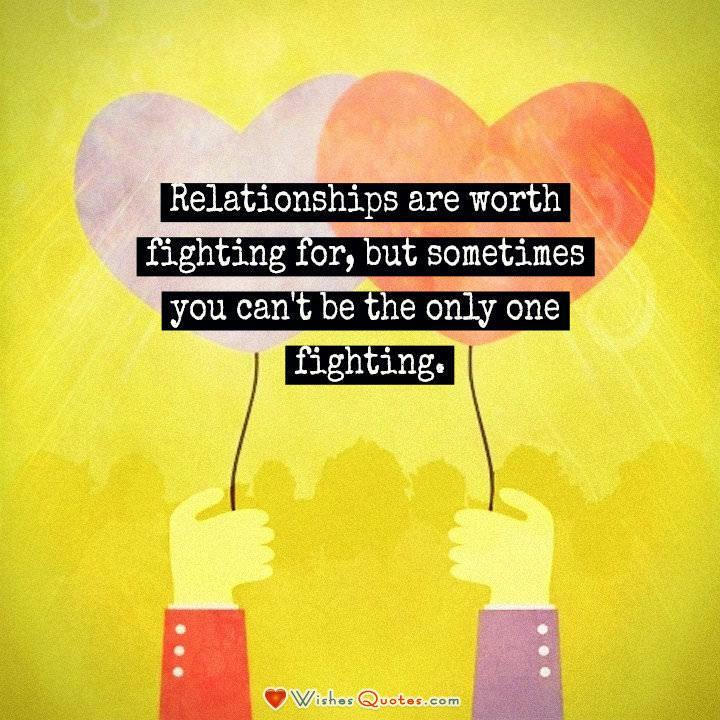 Relationships are worth fighting for, but sometimes you can't be the only one fighting. Every relationship goes through times when a couple may not be on the same page. It’s hard for any couple to agree on everything. Money, time, children, work, school, home: the list of things to argue about goes on and on. Fights in a relationship are a fact of life. However, it’s essential to remember that it takes two people to work as a couple. (Read: 5 Steps Toward Happier, Healthier Relationships) If only one person is fighting, the relationship is going nowhere. If one partner is doing whatever he or she wants, and the other person is constantly compromising and fighting, then the relationship is in trouble. A relationship cannot be sustained and grow unless both people are committed to it. Part of being committed to a relationship is being will to fight and argue like responsible adults. Couples that never fight are a myth.